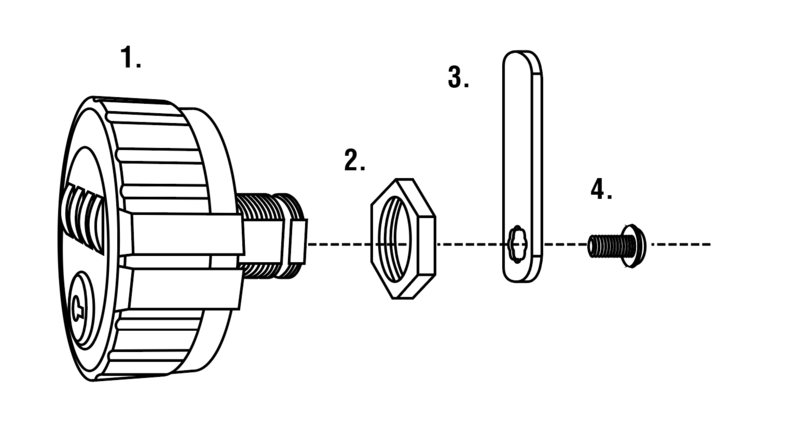 Before installing the lock, familiarise yourself with the installation and operating instructions. The factory preset combination is 0-0-0-0. Your KitLock is supplied ready to fit to doors up to 19mm (3⁄4”) thick. The KitLock can be fitted to cabinets, cupboards and lockers etc. as a direct replacement for existing cam locks. It can also be fitted easily to cupboards and cabinets that do not have an existing locking device. 1. Remove existing cam lock. 2. Fit the KitLock to the door, passing through the existing spindle hole. 3. Now secure the lock by threading the hex nut onto the spindle. 4. Fit cam and secure with screw. 5. Now check the operation of the lock using the factory preset combination 0-0-0-0. 6. If the lock is functioning correctly, change the code using the instructions overleaf. N.B. Optional Fixing Pack B (above) may be required. 1. Mark a position at a suitable distance from the door edge, ensuring enough clearance for the cam to work. 2. Using the ‘Typical Door Prep.’ Dimensions (see overleaf), drill a hole to suit. 3. 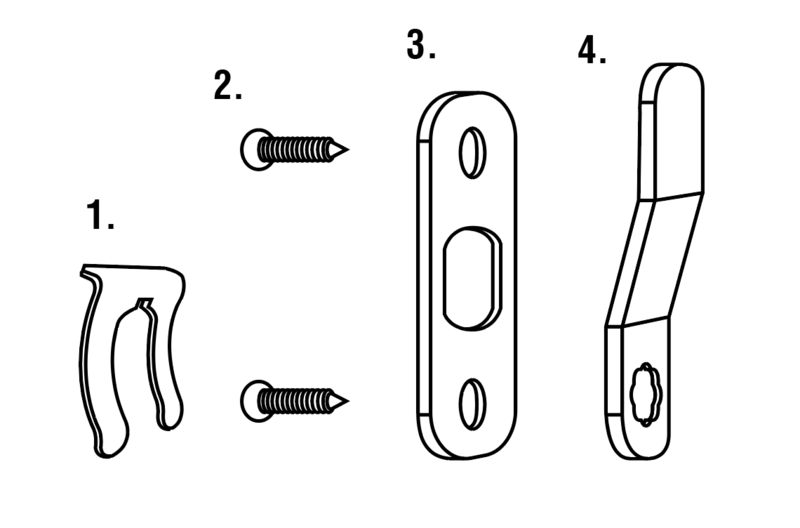 Continue installations from step 2 to 6, left. With the indicator in the open position, turn the dials to the factory preset combination 0-0-0-0 Note: If you have already changed the code, use your current combination for this step. Depress the reset button fully and hold, turn the dials to your desired combination. Note: Do not let go of the reset button while setting your combination. Release the reset button after checking your combination is correct. Note: The outer casing will turn freely between the open and locked position until the combination has been scrambled. 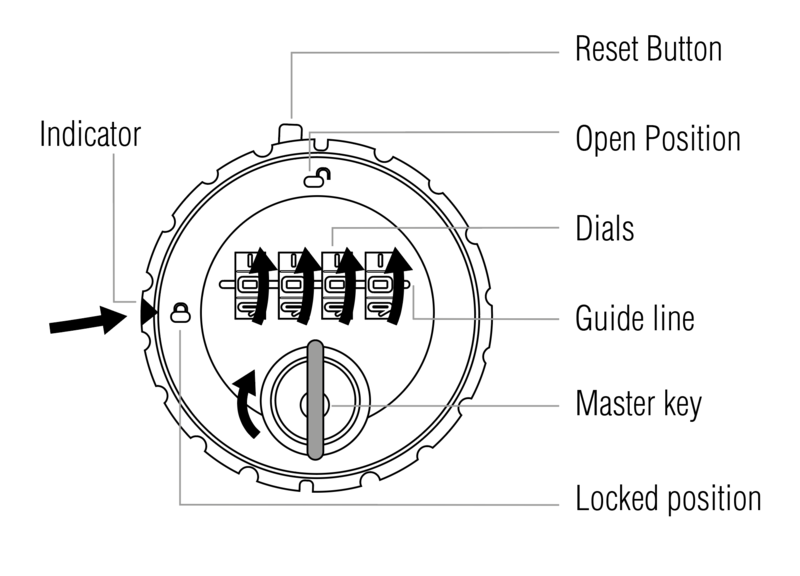 Once you have chosen and set your combination, turn the outer casing so the indicator is in the locked position. Make a note of your chosen combination and scramble the dials. The lock is now locked. To reopen, rotate the dials to your chosen combinations and turn the outer casing so the indicator is in the open position. Note: Your chosen combination will continue to operate the lock until it is changed. Note: This function requires the Master Key (sold separately). Insert the master key when the indicator is in the locked position. Turn the key clockwise 90 degrees. Gently rotate each dial upwards until it stops. This is your code. Turn the master key anticlockwise 90 degrees and remove.